I’ve stayed at a lot of hostels over the years. Many are just places to sleep and many others are great places to meet fellow travelers and swap stories and travel tips. The most rare type of hostel, though, is my favorite: a place to meet other travelers as well as lots of local people. 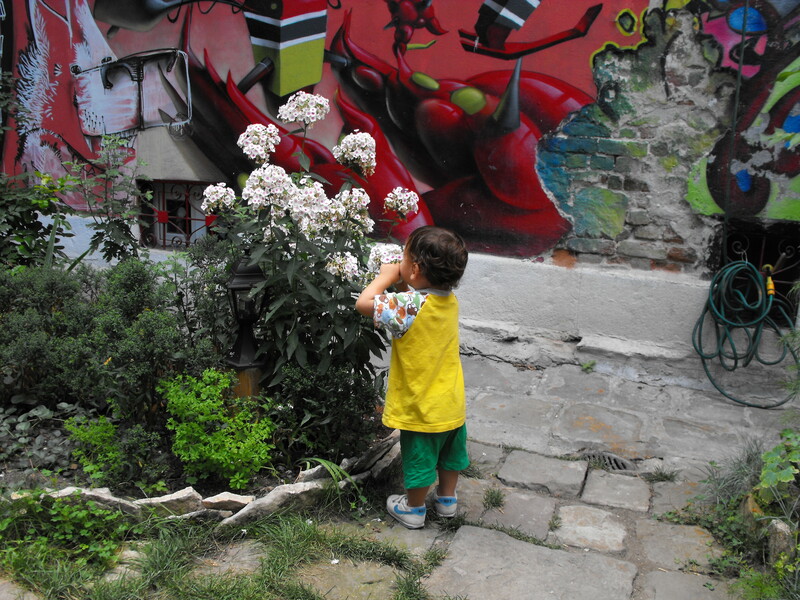 Art Hostel in Sofia, Bulgaria is just such a place. Whether by design or happy accident, Art Hostel’s set up means that you have to be a recluse not to meet lots of interesting people while staying here. To get to most of the rooms, you have to leave the reception area and go around to the back of the building – right through the garden. The hostel’s slogan is “Usually we spend our time in the garden”, and it’s easy to see why. It’s a very inviting place to hang out, especially at night when it is filled with backpackers, staff hanging out after work and local Bulgarians who just like the atmosphere of the place. Spending time talking to locals, as well as travelers from England, France, Germany, the U.S., and other countries has been a great treat. Many of the most stimulating conversations I’ve had in the past couple years have happened right out back in the garden this past week. Ian loved playing in the garden after his morning nap. In the evenings, the place was filled with backpackers and locals. The bar here is also great and another excellent place to meet locals and backpackers. Down in the basement, it’s right next to the garden, so you can drink outside or in the bar. It has a variety of rooms, many of which have been decorated with murals by local artists. And how many hostels can say that one of their owners is the host of an arts program broadcast on national television? Art Hostel can. Boris Georgiev, a rather charismatic 30-year-old veteran of Bulgarian theater, hosts Antrakt on Probg, Bulgaria’s largest TV station. When he’s not acting or working at the hostel, he is often in – you guessed it – the garden, enjoying a beer with local friends and guests. He’s very easy to talk to and will welcome you into whatever group he is with. Great guy. If you’re ever in Bulgaria and actually want to learn about the local culture, check in at the Art Hostel and have a beer with Boris. You’re also guaranteed to meet a lot of other interesting folks while there. In all my travels, I have stayed at only a few hostels like this one. It’s a rare treat to find such a place, and I thoroughly enjoyed my time there. It was actually my favorite part of Sofia.